The bedroom is so very important, it is where we need to relax and unwind so here are my beautiful bedroom tips for a show stopping bedroom that you will just love to retreat to. 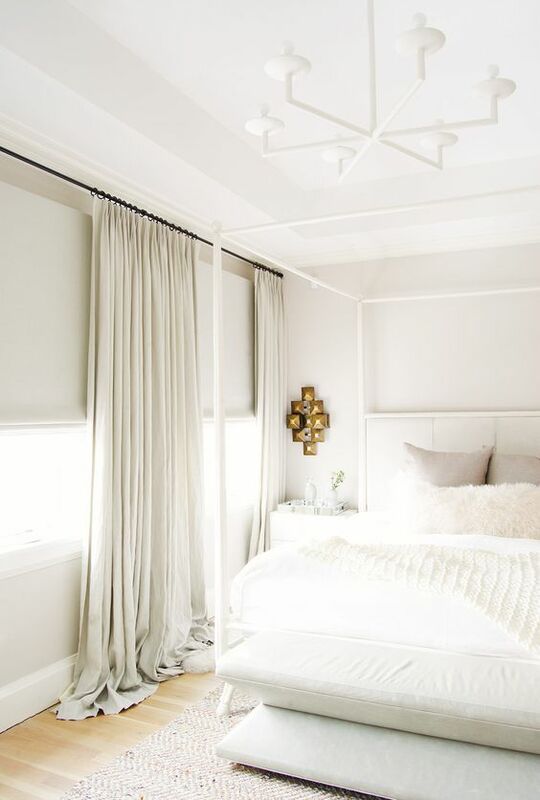 You want everything in your bedroom to define serenity & calm, and the color scheme should be top of the list. Neutral colours naturally promote a sense of relaxation however you could also try using cool calming shades such as greens and blues. Keep strong colours to a minimum by picking one element of the room to be that colour i.e. the bedspread, the walls or the curtains & cushions. 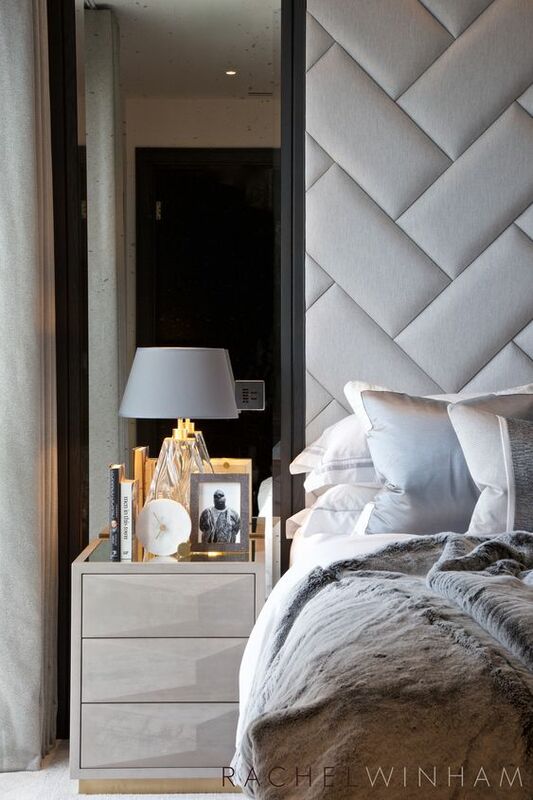 The headboard can make an amazing statement in your bedroom and for me the bigger the better! Even if you have a small room, high headboards can create the illusion of space. There are so many different styles to choose. 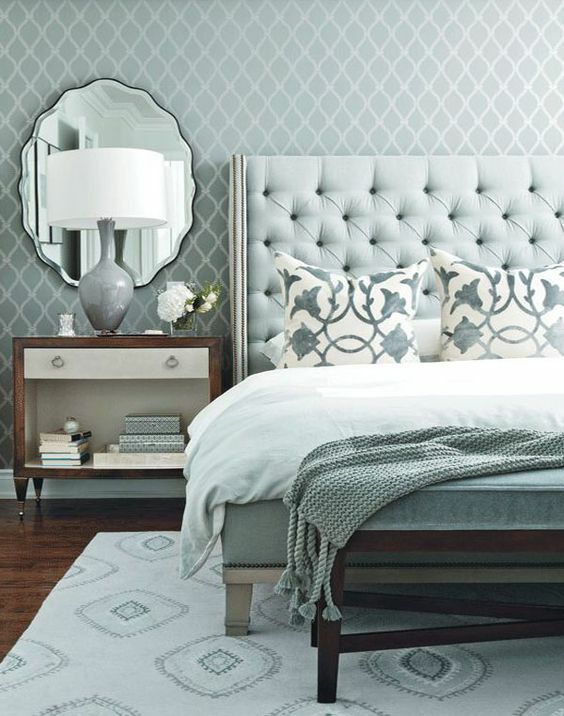 You could have a deep buttoned headboard or go for a bold fabric and keep the detailing simple. 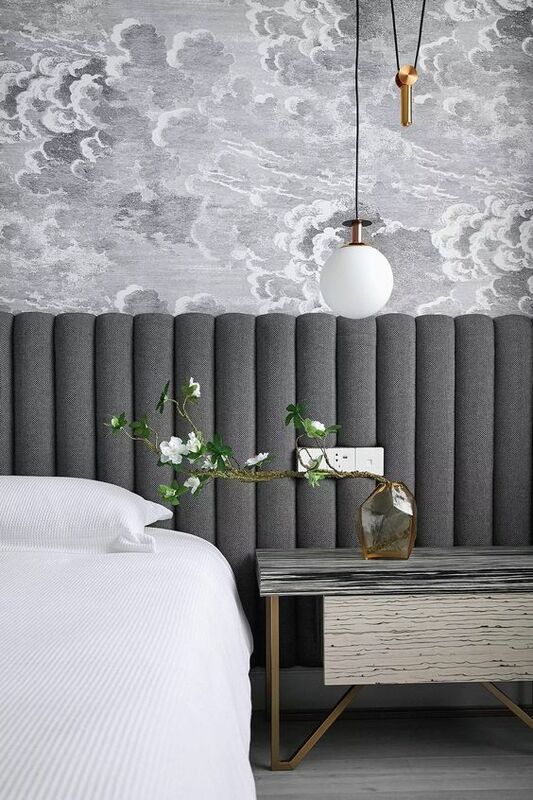 It’s becoming more and more popular and oh so stylish to create shapes with individual panels; these also look fantastic if you’re daring enough to have a full panelled wall as your headboard. I usually recommend choosing neutral, plain bedding. It’s then important to layer accessories on the bed for ultimate luxury and a sense of indulgence with a combination of different sized cushions for depth and varying throws and blankets of different textures, colours & patterns. 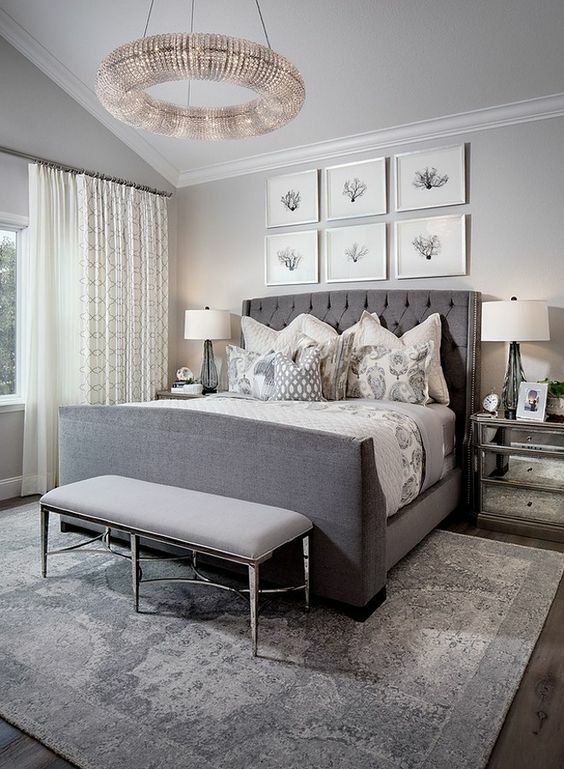 A room is never completely finished until the windows are dressed and the bedroom is the one place I would recommend investing in a good pair of heavily interlined curtains. Always floor to ceiling and always in an opulent fabric that works in harmony with the rest of your scheme. 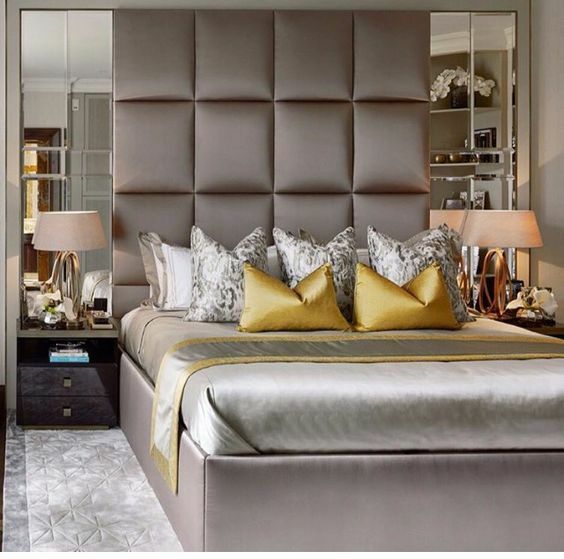 It is important in any room to ensure you have a layered lighting scheme but perhaps even more so in the bedroom. It is important to create that feeling of ambience and there is no better way to do this than with lighting. Ensure you have your overhead lighting or decorative chandelier on a dimmer. It is also important to have either wall lights by your bed for reading or simple convenience or some magnificent table lamps that will really add a touch of glam to your bedroom. A key feature in your bedroom interior design; bedside tables Great bedside styling doesn’t just happen, there’s generally some well-considered thought, a little planning and a lot of inspiration behind it. 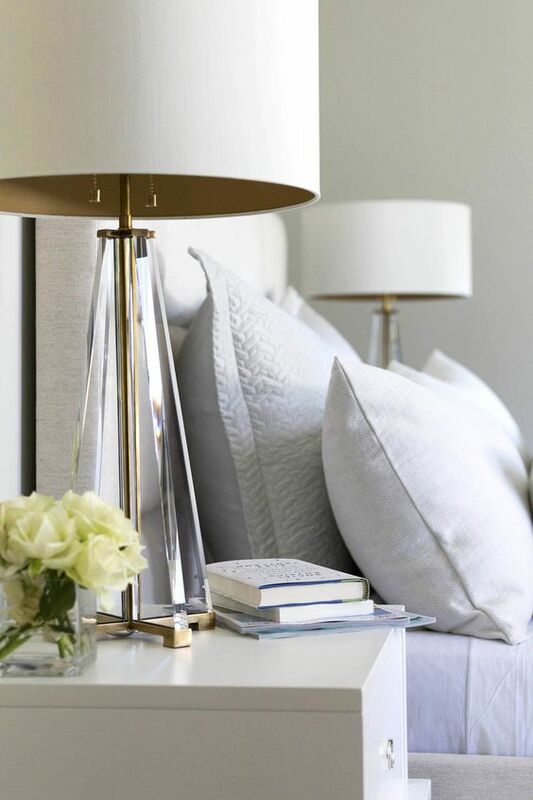 Opt for bedside tables with enough storage so that you can declutter and save the surface for the all important accessories; remember however that these accessories should carefully considered such as candles/diffusers and flowers. We recommend arranging accessories into sets of 3, and in varying heights, so as to formulate a triangular grouping (triangular compositions create a sense of stability, balance and serenity). Achieve this by using a high lamp and 2 accompanying accessories lower in height, such as a photo frame and candle or diffuser. The use of flowers in your bedroom interior design can add a pop of colour to what may be a neutral interior scheme. Florals add texture and allow you to change the style of your room easily.